Question:Hi, when I make a file with excel and word and print them to PDF the quality of the resulted PDF is lower than the original excel and word and the formats are changed. Please guide me how to solve this problem. Is there a solution on VeryPDF? Answer: Normally speaking, when you convert files Excel to PDF, word to PDF by printing method, the quality of output PDF file will be effected. If you use software VeryPDF Office to Any Converter to run the conversion, this problem could be solved as it allows you to convert Excel to PDF, word to PDF lending the power of MS Office. When you need to output high quality PDF file from MS Office file, I guess this software is a better solution for you. And by this software you can also encrypt, edit description and add watermark for converted PDF. Please check more information of this software on homepage, in the following part, I will show you how to convert Excel to PDF, word to PDF with original quality. Step 1. 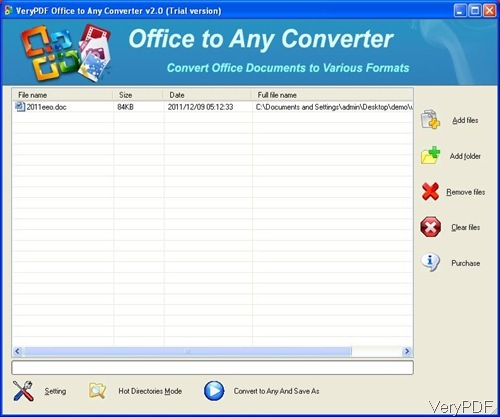 Free download Office to Any Converter. This software has friendly software interface, so you need to install it. When downloading finishes, there will be an exe file. Please install this software by double clicking the exe file and following installation message. Step 2. Convert Excel to PDF, word to PDF by MS Office. After launching this software, please click button Add files to add word or Excel file to software interface. Or you can drag them from its containing folder to software interface. Click button Setting to to the setting part. The following snapshot is from the setting menu option, please have a check. There are many tabs in the setting menu. Please go to tab of Basic Setting then you will find options like I showed in above snapshot. There are two options Use MS Office for Conversion and Don’t use Office for conversion. Please choose the first one. Once you set that option, this software will convert files from MS Office directly, so the output PDF quality will be much better. If you need to do other settings, please go to other tabs. If you do not need to set other limitation, please click button OK to back to the main interface. When you back to the main interface, please click button Convert to Any and Save as. A few seconds later, you can find output PDF file in specified folder. By this software and this method, we can convert Excel to PDF, word to PDF in high quality. During the using, if you have any question, please contact us as soon as possible. This entry was posted in Office to Any Converter and tagged excel to pdf, word to pdf. Bookmark the permalink.